Stone: mother of pearl shell. Shape :leaf. Quantity: 13 beads. Size: approx. 38-42mm in length, 15-20mm wide. Approximate Size : 11mm. Materials: Shell. very glad to solve all problem with you. Color: as photo. CLOSEOUT PRICED - BELOW COST WE ACQUIRED THESE AT THE TUCSON SHOWS FROM A VENDOR WHO WENT OUT OF BUSINESS! VERY LIMITED SUPPLIES - WHEN GONE THAT'S IT FOLKS! PICTURE IS AN EXAMPLE OF THE MATERIAL WE ARE CLOSING OUT! EACH IS UNIQUE AND EACH WILL VARY! YOU WILL RECEIVE TWO LARGE 3 1/3 INCH x 2 1/3 INCH MOP OVAL MABE CONNECTOR BEADS! These are Not Easy To Find. These measure approximately 3 1/3 Inches x 2 1/3 Inches On Average. A mabe pearl is a half-spherical cultured pearl grown on the inside shell of a mollusk, as opposed to inside a mollusk's body. Mabe pearls are grown by glueing a plastic hemisphere onto the inside of a mollusk's shell. Bead, mother-of-pearl (dyed), burnt orange, 32x5mm-54x10mm top-drilled talon, Mohs hardness 3-1/2. Important! SILVER VILLAGE. Send it back. No explanations necessary! Money Back GUARANTY! 40-50mm Natural Bronze Mother of Pearl Leaf Pendant Beads 16"
Stone: mother of pearl shell. Shape :leaf. Quantity: 13 beads. Size: approx. 40-50mm in length, 15-20mm wide. Doing that is against U.S. and international laws. Send it back. No explanations necessary! Money Back GUARANTY! Stone: Mother of Pearl. Quantity: 1 bead. Shape :disc. Freeform Shell Mother of Pearl Loose Beads White Black 14mm-22mm 15"
SIZE: approx 14mm 28g/strand. We are wholesaler. Rondelle ~freeform / circular. This characteristic might apply to other dark colors but consistent in the deep reds. 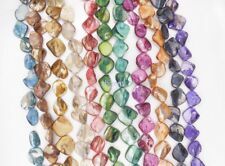 Vivid jewel tone colors, each unique in size, shape, and color. String this mix or add other natural materials for an eye popping piece of jewerly you'll treasure and others will want. MATERIAL: shell. You may also like. We are wholesaler. 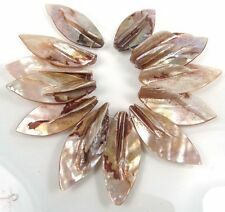 They simply sparkly with pizazz; the perfect touch to adorn any design with unique one of a kind mother of pearl. These are natural mother of pearl shell beads. Material Type: White Mother of Pearl. Qty: 1 strand. 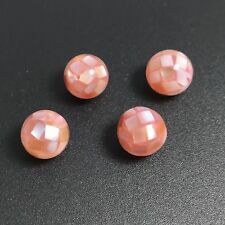 Bead Size: about 16X31mm. 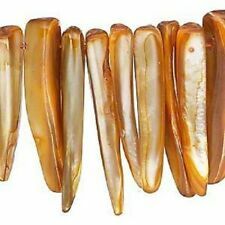 Five Beautiful 9/10 Inch x 3/5 Inch Topdrilled Natural Mother Of Pearl Phoenix Bird Fetish Beads. Hole Size: .9mm YOU WILL RECEIVE FIVE PHOENIX BIRD BEADS! THESE ARE SPECIAL CUTS FOLKS! YOU WILL FIND THESE NOWHERE ELSE! I don't expect this lot of Unique Beads to last long - SO GET YOUR PURCHASE IN TODAY!!!! SAVE OVER HIGH MARGIN RIPOFF JEWELRY STORES AND SO CALLED "DISCOUNTERS"!!!! B21A104. ~ Natural Carved Flower Natural Mother Of Pearl Bead Strand~ FREE SHIPPING - THIS ITEM - US ONLY! Strand Length : Approximately 15 Inches Color: White Creme Brown Size: 20mm - 4/5 Inch Type: Carved Flower shellbeads34. 12mm Green Mother of Pearl Shell Cross Beads 15"
Size 8mm x 12mm x 2mm. Material Mother of Pearl. Gorgeous beads! Nice mother-of-pearl beads! Shape Cross (Cross Drilled). Color Green. 12mm Light green yellow Mother of Pearl Shell Cross Beads 15"
Size 8mm x 12mm x 2mm. Material Mother of Pearl. Gorgeous beads! Nice mother-of-pearl beads! Shape Cross (Cross Drilled). Color Light Green Yellow. 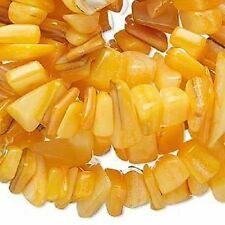 12mm dark yellow Mother of Pearl Shell Cross Beads 15"
Size 8mm x 12mm x 2mm/5mm. Material Mother of Pearl. Gorgeous beads! Nice mother-of-pearl beads! Color Dark Yellow. Shape Cross (Top Drilled)/Potato. 4mm White mother of pearl Round beads 16"
Material Mother of Pearl. Gorgeous beads! Nice mother-of-pearl beads! Shape Round. Color White. 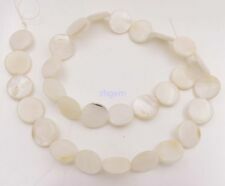 9-18mm White mother of pearl Nugget beads 16"
Shape Nugget. Material Mother of Pearl. Gorgeous beads! Nice mother-of-pearl beads! Color White. 9mm White mother of pearl Rice beads 16"
Shape Rice. Material Mother of Pearl. Gorgeous beads! Nice mother-of-pearl beads! Color White. Wholesale 15-25MM White Shell MOP Freeform Shape Gemstone Loose Beads Strand 15"
ORDER 10 STRAND GET 1 STRAND FOR FREE! Quantity: 1 Strand (19-20Pcs). Material: Shell (lead free & nickle free). We will try our best to solve the issue. Top quality; Competitive price;. Note:The Picture Shown Is a Representation Of The Item,you'll Receive From The Available lot. ~ Natural Carved Flower Natural Mother Of Pearl Bead~ FREE SHIPPING - THIS ITEM - US ONLY! Color: White Creme Size: 20.5mm - 4/5 Inch Type: Carved Flower ebaystore7125. Size: 20x20mm. GemStone Type:-- Mother of Pearl. Shape:Round Beads. We specialize in Pearl, Coral, Turquoise, Crystal and another semi-gemstone Jewelry. We are also an importer and wholesaler of semi-gemstone jewelry. GemStone Type:--Natural Colorful MOP. Shape:Oval Beads. High Quality Beads! Sizes and the shapes may vary Slightly from Picture. Quantity:One 15" Strand. Local pickup option We specialize in Pearl, Coral, Turquoise, Crystal and another semi-gemstone Jewelry. Shape: Nugget. WHOLESALE NATURAL JEWELRY BEADS. Bead size: Approx. A beautiful mix of lustrous mother-of-pearl beads in five randomly assorted iridescent colors. Thesemother-of-pearl beads are great for contrast and 'island style' jewelry. ~ WHEN THESE ARE GONE - THAT'S IT FOLKS! GREAT PRICE! GREAT VALUE!~Our Wholesale Replacement Cost On These Run Around $24!!! FREE SHIPPING - THIS ITEM - US ONLY! Color: Purple Gold Silver Type: Mother Of Pearl Overall Length: 24 Inches shellbeads27. Quantity: 1 Strand (19-20Pcs). We will respond within 24-48 hours, in most cases sooner. Material: Shell. Note:the picture shown is a representation of the item,you'll receive from the available lot. We specialize in Pearl, Coral, Turquoise, Crystal and another semi-gemstone Jewelry. We are also an importer and wholesaler of semi-gemstone jewelry. GemStone Type:-- Mother Of Pearl. Shape:Coin Beads. Size: 4x4mm (25mm=1"). GemStone Type:-- Mother of Pearl. Shape:Round Beads. Sizes and the shapes may vary Slightly from Picture. High Quality Beads! Quantity: One 15" Strand. ~ Carved Mother Of Pearl Focal ~ FREE SHIPPING - THIS ITEM - US ONLY! PLEASE NOTE THAT EACH CARVING WILL VARY! PICTURE IS AN EXAMPLE. Count: One Size: Approximately 2 Inches Color: Cream AB Flash Theme: Floral Type: Carving EBS7858. ~ Carved Mother Of Pearl Focal ~ FREE SHIPPING - THIS ITEM - US ONLY! PLEASE NOTE THAT EACH CARVING WILL VARY! PICTURE IS AN EXAMPLE. Count: One Size: Approximately 2 Inches Color: Cream AB Flash Theme: Fish Type:Carving EBS7851. ~ Natural Carved Flower Mabe Mother Of Pearl Bead ~ FREE SHIPPING - THIS ITEM - US ONLY! YOU WILL RECEIVE THE CARVING PICTURED! NO STOCK PHOTO'S HERE! Color: White Creme Size: 1 9/10 Inch Type: Carved Flower ebaystore7012. GemStone Type:-- Mother Of Pearl. Shape:Coin Beads. We specialize in Pearl, Coral, Turquoise, Crystal and another semi-gemstone Jewelry. We are also an importer and wholesaler of semi-gemstone jewelry.